Do you want to add a sense of danger or impending doom to attack rolls that come up woefully short in your Starfinder games? Do you want critically fumbled spells to tangle casters in ectoplasmic slime? Or do you think throwing the pin instead of the grenade is hilarious? When you roll a 1 on an attack, simply draw a card and apply one of four different effects based on attack type. 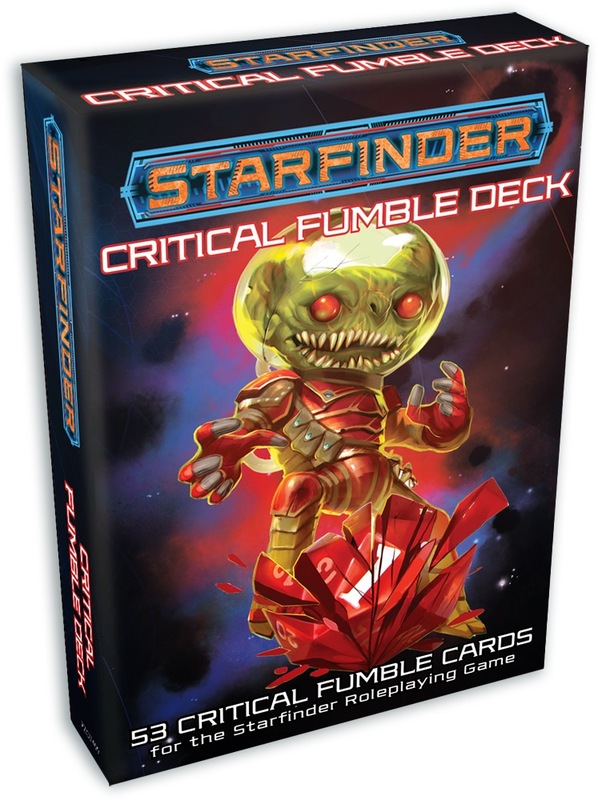 These cards are designed to work with the Starfinder Roleplaying Game and can be used by players and GMs alike. Failing miserably has never been more fun! 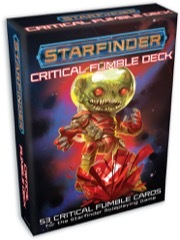 Note: This product is part of the Starfinder Accessories Subscription. This could actually work, as so far only goblin weapons explode on a natural one. "Preorder expected March 2018"? Should read 2019 I guess? Yes, all march & april 2019 products so far (Pathfinder maps & Starfinder pawns & cards) are wrongly listed for a 2018 release. Any chance I can find out the color theme of these? I mean like the Critical Hit ones have red title bars. What do these have? Is there a chance for a bit of sample art? I took a look at these and just like the critical hit deck, i have no interest in using these. I would however be tremendeously interested in a starship stats deck, Alien Archive deck, Armory deck etc. Any chance for a pdf version?